Happy April Fool's Day everyone! I am so glad we have today off of school...haha, some of my students were quite disappointed when they realized we wouldn't have school but not me!!! No April Fool's pranks going on here! Did you see the most exciting thing on my currently? If not go back up and be sure to read "loving." So did you see it?! Loving: We won our iPad grant!!! The teachers in my program worked together to write a grant for iPads for all of our students and we got it! We will get the teacher iPads in May and then go through trainings throughout the summer and then in the fall all of our students will have iPads too! I'm so excited!!!! Feel free to share any advice/favorite apps if you also use iPads in your class. I'm learning life becomes easier when you allow yourself to NOT do it all, if that makes sense. All of the other areas are self explanatory, so that's all I'm writing for now! Be sure to link up with Farley if you haven't already! P.S. If you haven't signed up for Educents yet, they launch tomorrow and today is the last day to get a free $10 credit when they launch!! Congratulations on the ipad grant - I am super jealous. I would love to have one so we could start using all the great apps and QR code activities people keep talking about. Love your advice! I love your advice. Your right you can't do it all and I am SOOOO guilty of trying to do it all. Learning to say no is tough sometimes but you have to do it! Great reminder! Thanks! Congratulations on the iPad grant! LOVE our iPad - you will too! WOOHOO!!!!! Your Ipad grant is awesome! I think that there are so many amazing things that can be done using those contraptions. I am jealous!!!! Congrats on the iPad grant. 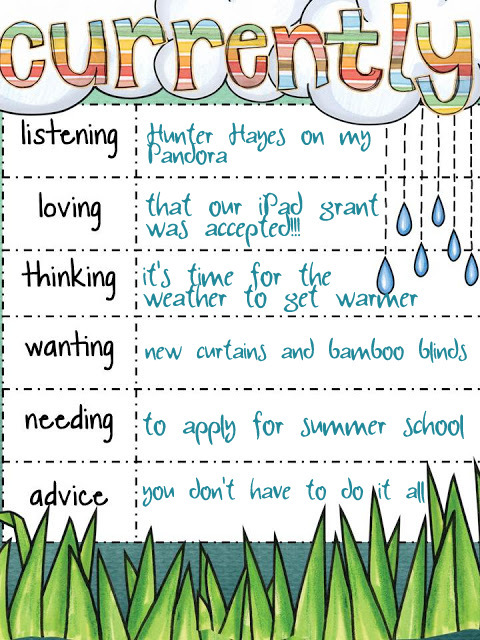 Have you decided what you;re planning on using the iPads for? TCEA has a great list of apps free and paid. Thanks! We plan on using the iPads or a lot! During classroom instruction, direct instruction, as a reward, using the schedules and timers. So many possibilities! I will check that list out, thanks for sharing. WOW! How awesome! Congrats on the IPAD grant! I want ipads for my kiddos, that would be wonderful! & I Love Hunter Hayes! Congratulations on the grant. That is awesome! There are some great functional skills apps by Conover. If you put that name and functional in a search in the App Store you should find them. There are visual cues and video modeling included. I did a post on them a while ago. Give me a shout if you want me to track it down. It's been a while since I checked out what is out there so I will definitely watch those what you find! I love my iPads and so do my kiddos! I love the Hunter Hayes station too!